StencilGirl Talk: Shibori, Stencils and Frisket, Yes Please! 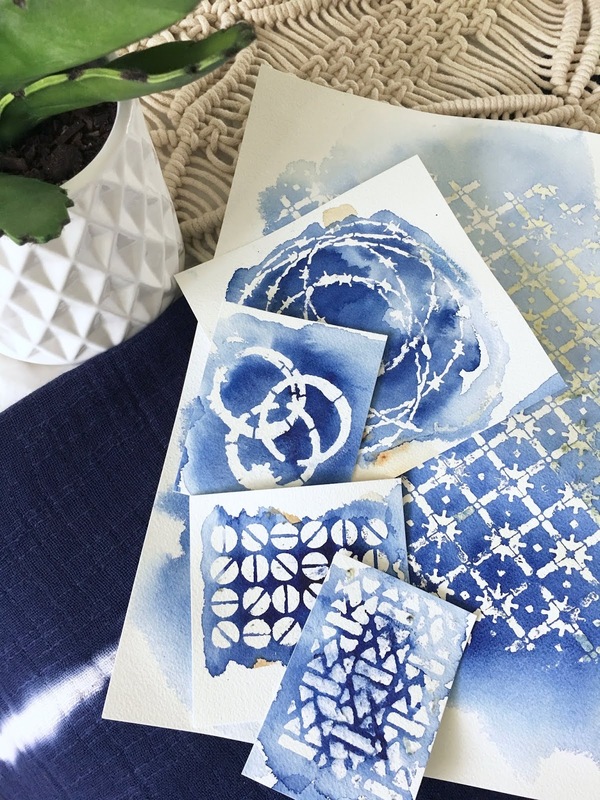 Shibori, Stencils and Frisket, Yes Please! Hi everyone! Happy to be joining you on the StencilGirl Talk blog today. 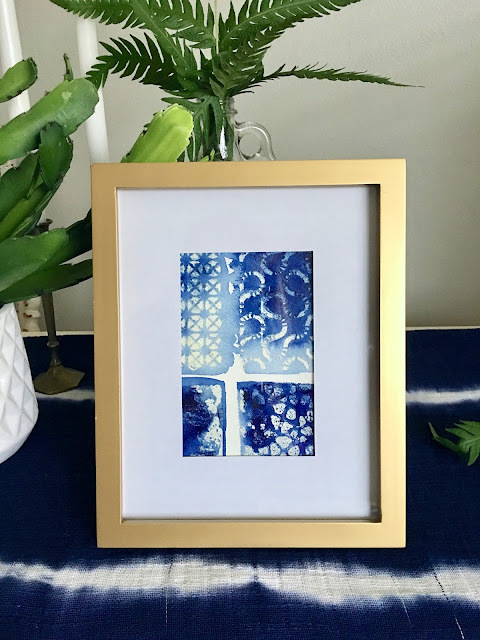 I’m Debi Adams and I thought I would share one of my favorite art forms, Shibori, albeit a slightly different technique/application and, use of stencils, of course. 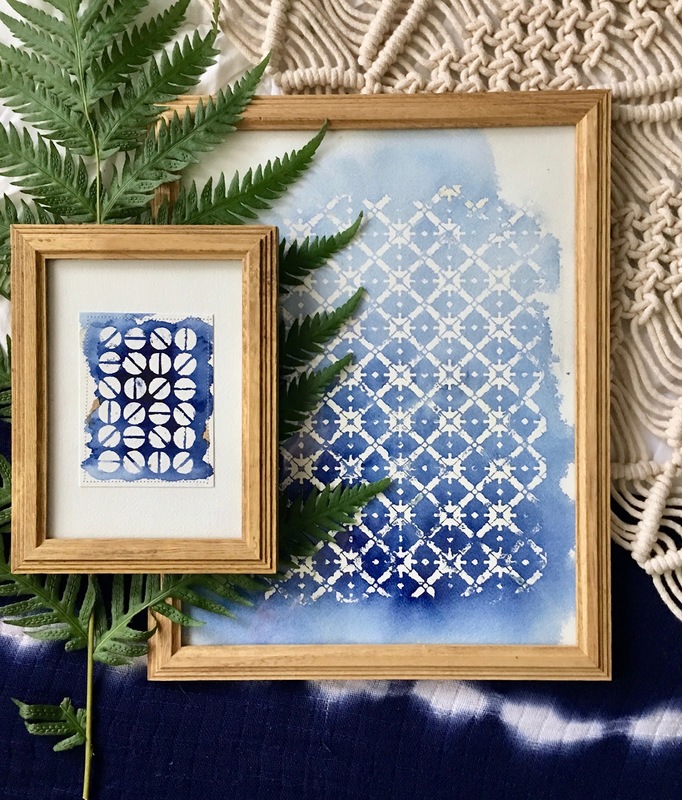 My approach to both stencils and Shibori is to go modern and trendy. 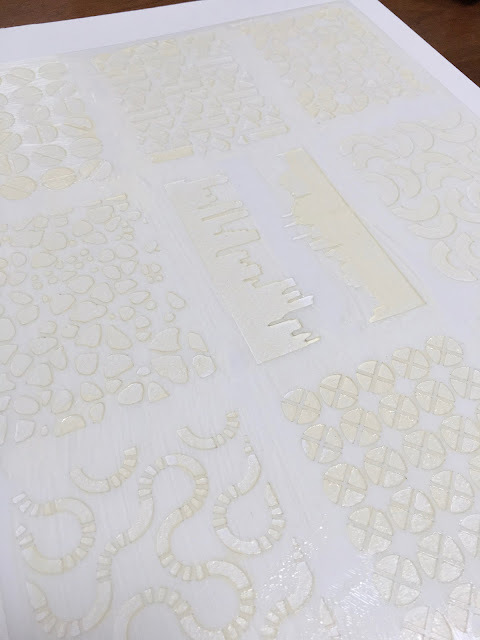 Although stencils are used for lots of layering and are very beautiful, they can also be used in their basic form without much application and be very clean. 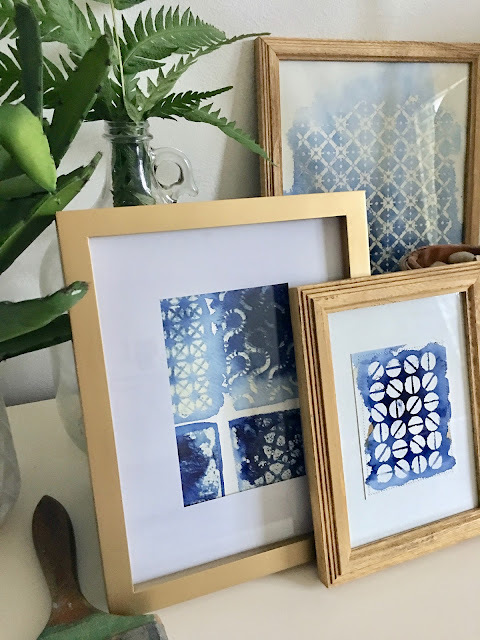 Since I am redoing the spare room in my house to reflect shibori and a bit of boho, I thought I would make some art to go on the walls. 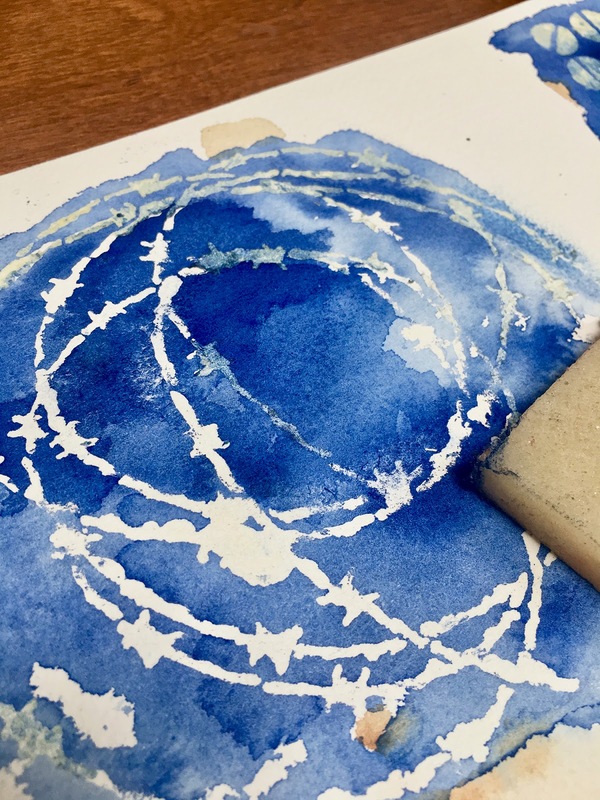 I love watercolors a lot and decided to create the shibori-look using watercolors on watercolor paper, and the non-dyed portion, using frisket. 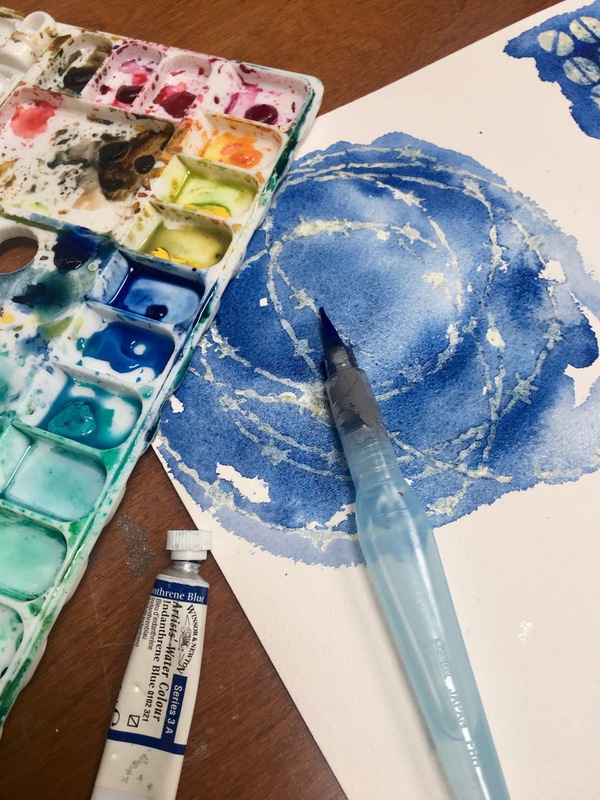 Frisket is a liquid that when applied, blocks out watercolor from seeping through paper and retains the underlying color of paper, in this case, white. It is a lot of fun. (For a layered look, you can add a color to the base or ephemera paper to the substrate before applying the frisket). For my substrate, I chose Arches Watercolor paper. It’s my favorite and by far the most successful look when watercoloring but you can use other watercolor papers as well. I laid my stencil down on top of the watercolor paper. You can tape it down if you like, or not. (The stencils and all supplies are at the bottom of this post.) 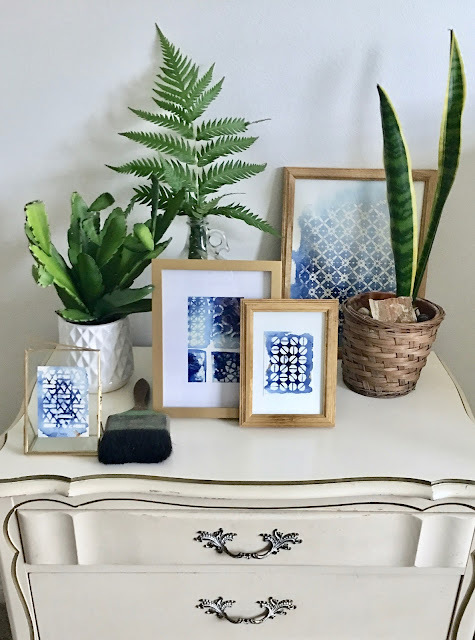 I picked these (mostly) repeating, patterned stencils because I felt that they closely resembled the shibori-tied or folded-look, however, you can use almost any stencil. Use a foam brush and apply the frisket. Frisket dries quickly so it’s important to get a good coat on the first time around and move quickly to cover the entire stencil. When done, remove stencil and wash off the frisket from the stencil immediately. I toss the brushes because they are harder to clean and for the most part, are inexpensive. When completely dry, 5 minutes or so, it is safe to watercolor. I like Winsor Newton brand and since Shibori is generally a blue dye, I used a deep blue color. I misted my substrate first then began applying paint. I added more blue coverage here and there so it gave the appearance of inconsistent dying. Once my substrate was covered, I let it dry. It can take a while if you used a lot of water, which I generally do. After the paper is dry, use a frisket eraser to remove all the frisket and reveal the white paper that has been left behind. I love the simplicity of these wood frames. It's organic and draws attention to the art. Perfect for my room! And consider making it even more modern and classy just by using gold frames. And a trio always looks nice and impactful, I mean, once you're on a roll, why not? 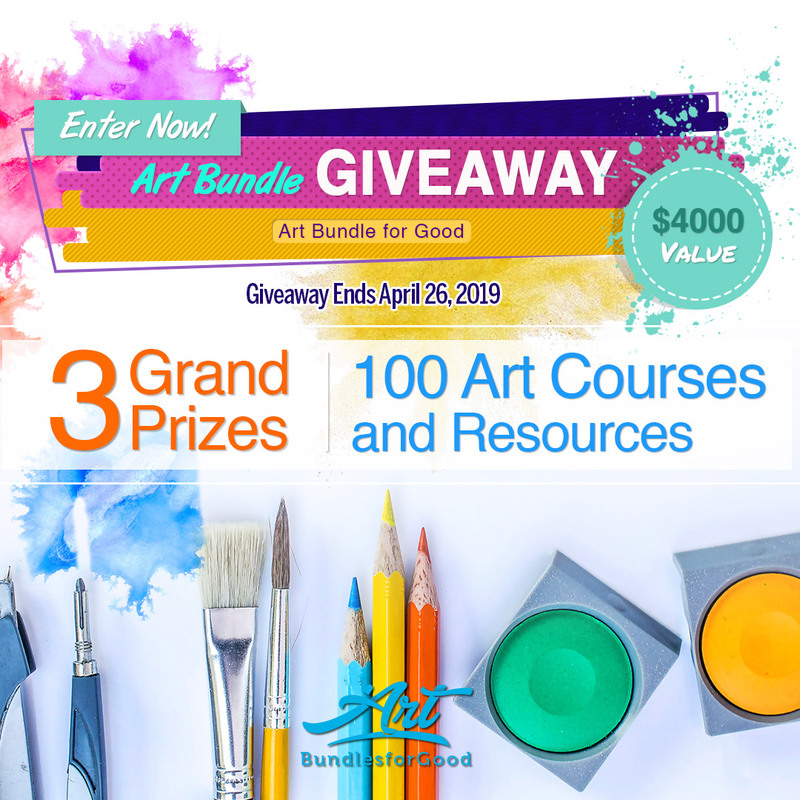 Don't forget about other possibilities of using your art in your home. Think of greeting cards, place cards, invitations, etc. Oh you so got this! Thanks for popping in. 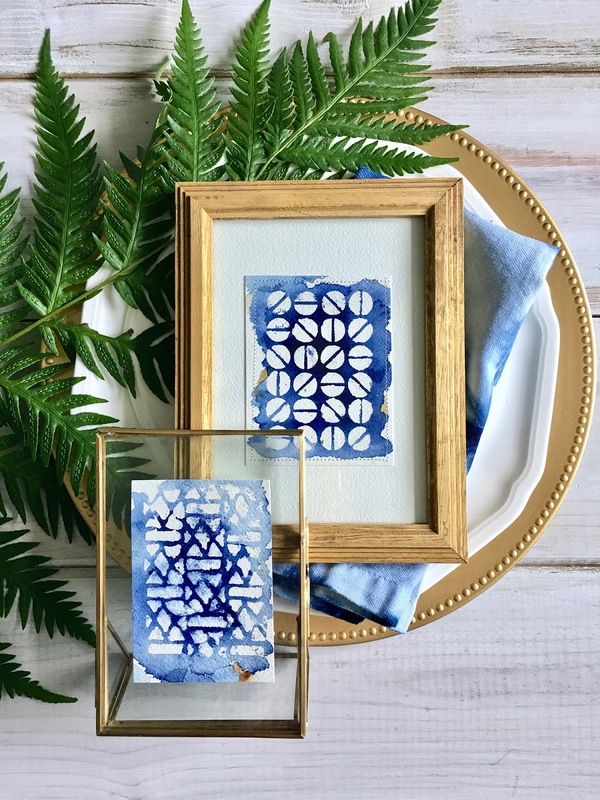 If card making interests you, check out my StencilGirl® online course here! It's available to play whenever/where ever you are! Thank you Andrew. Drawn to your stencils a lot. I love that shade! Thank you. Thanks Margie. One of my favorite colors. Love these! 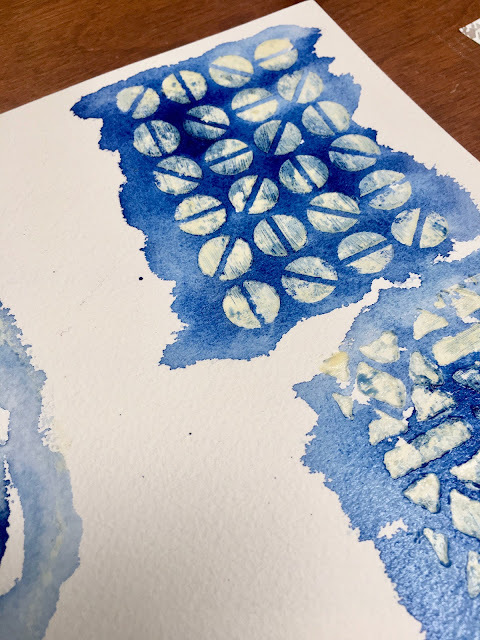 Is frisket different from masking fluid? I have had a bottle of Frisket, that is also called Incredible White Mask. Haven't figured out how to use it. Thanks for the information. The simplicity of doing this in a monochromatic blue reminds me of the old fashioned blue and white porcelain dishes my mom had. It’s elegant looking with a modern twist. I love the look of these framed the way you did them.